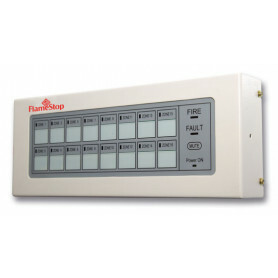 Mimic Panel for FlameStop Conventional Fire Alarm Panels There is 1 product. Specifications, images and particulars in relation to products are subject to change without prior notice and FlameStop Australia will not be held liable in any way for any errors or omissions. It is the responsibility of the customers to verify that a chosen product is suitable for their given application. © Copyright 2017 - 2019 Flamestop Australia Pty Ltd. All Rights Reserved.